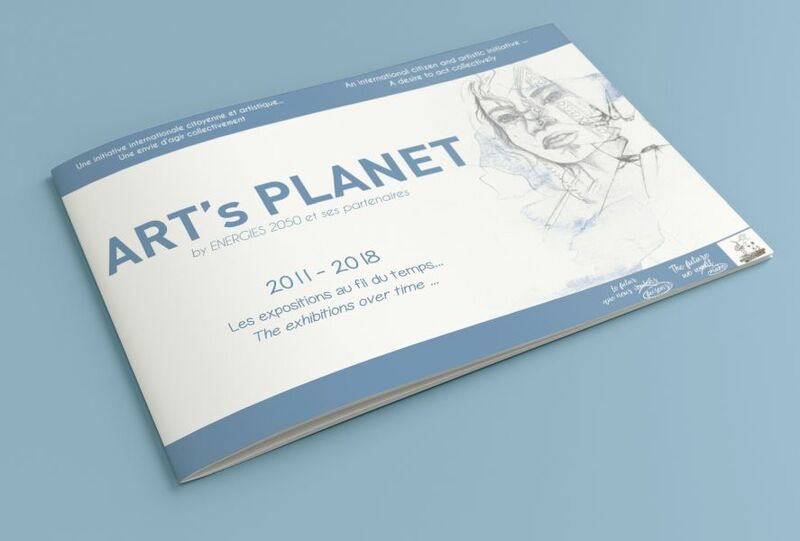 The 2018 edition of ART’s PLANET by ENERGIES 2050 is launched in partnership with several international and national organizations. 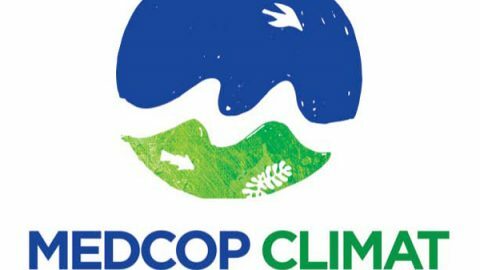 The final exhibition will be organized during COP24 in Katowice (Poland) from 3 to 14 December 2018. 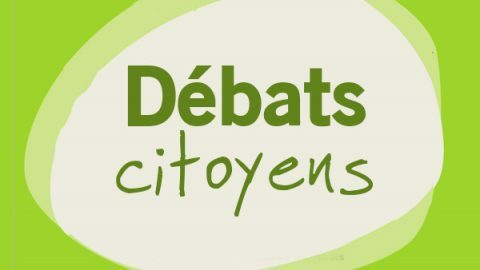 Like the previous editions, participation is totally free. 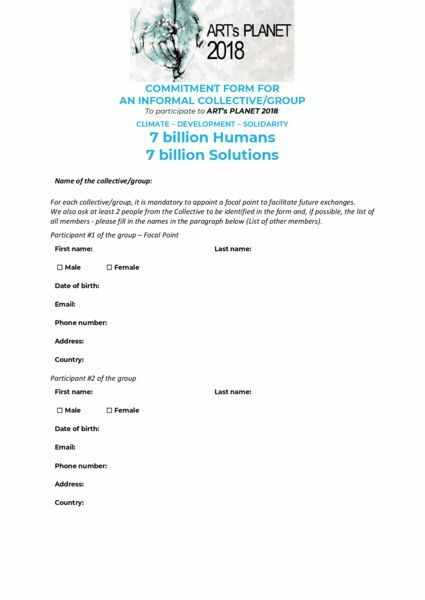 Each participant can contribute in whatever medium chosen (see the rules). Each participant can also decide to go beyond a simple contribution by offering its artwork that will be sold later in an online auction to support concrete projects. Funds raised will be used to support solidarity projects and initiatives in “so-called” developing countries with a focus on vulnerable communities with a particular concern on women and youth. 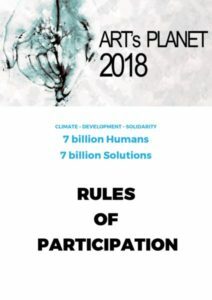 The 2018 edition reflects the will of ENERGIES 2050 and partner organizations to contribute to the building of a positive and plural common future, vector of universal values of solidarity, while putting citizen cooperation and art at the heart of awareness and action. Day by day, our societies are facing social, environmental and economic crises that are increasingly violent and worrying. The question of access to resources and the consequences of our modes of consumption and production exacerbate the already existing problems. In addition, the issues of wealth distribution, development needs and the high growth of the world’s population add to these challenges. The realities of the consequences of climate change are already present. They remind us of the need to act collectively as quickly as possible in order to give back to our development trajectories a different sense for a well being shared in the respect of natural resources and a solidarity to be reinvented. That being said, the desire to act can only become a reality if everyone brings and combines his contribution with an active benevolence in the service of the collective. For that, every little step is indispensable and the mobilization of everyone is necessary. It is in this spirit that the theme of the 2018 edition has been retained so that everyone can re-appropriate himself a collective concern and can understand, remember, feel concerned and act. The desire to protect this plural humanity and our planet so dear to our hearts can only be done collectively. 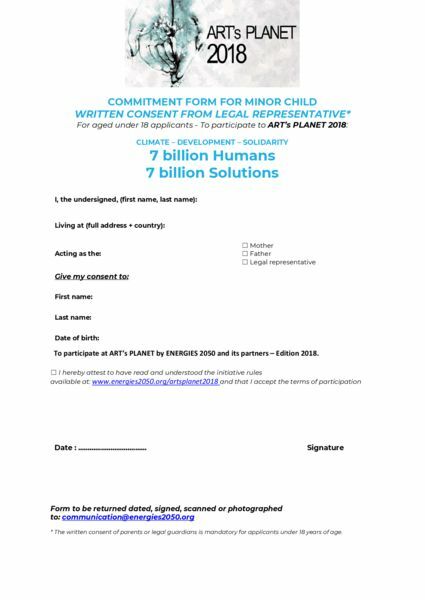 ART’s PLANET wants to be a space of freedom created so that every citizen can take back his place in the collective partition and contribute with his stone to this citizen and art international exhibition favorable to the expected changes. 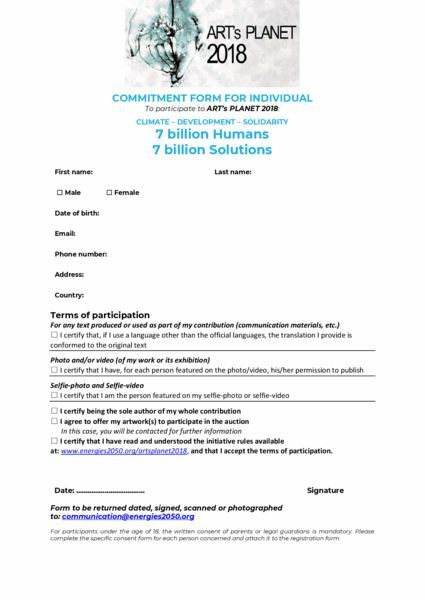 “Climate – Development – Solidarity: 7 billion humans, 7 billion solutions” aims to promote dialogue between citizens around the world. 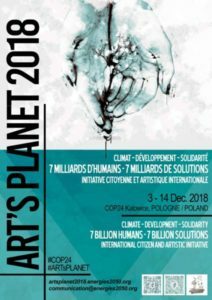 With this initiative, the partners of the 2018 edition of ART’s PLANET aim to involve citizens of the world, the official delegates and the participants of the COP24 in the same initiative through an interactive art exhibition and thus to promote the setting in place multiple sustainability commitments. 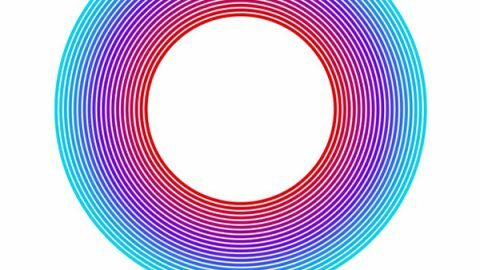 ART’s PLANET by ENERGIES 2050 has its origin in the international initiative, Shake Your Earth! 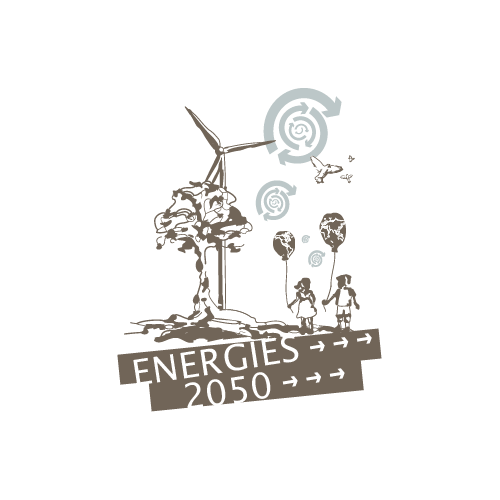 launched by ENERGIES 2050 in 2011 in partnership with national and international NGOs. This initiative has set up an annual global day of information and exchanges on the challenges of sustainable development, climate change and the protection of the environment. It’s aimed at professionals, decision-makers and, in general, all those concerned by these issues. 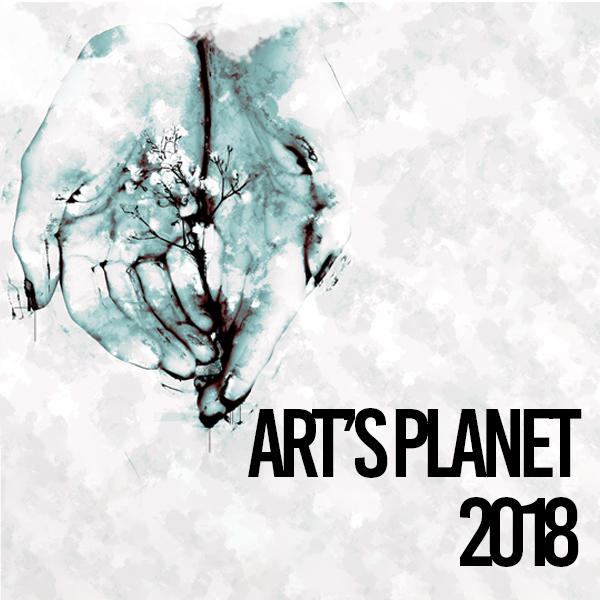 Based on Shake Your Earth!, ART’s PLANET by ENERGIES 2050 was created in 2015 to highlight these collective concerns about the future of our planet, solidarity, the fight against climate change and the support to vulnerable populations around the world. My climate today, my climate in 20 years, and me? 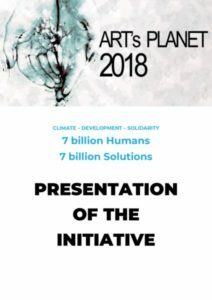 The second international exhibition ART’s PLANET by ENERGIES 2050 took place during the 22nd Conference of the Parties (COP22) held in Marrakech from 7 to 18 November 2016. The exhibition was presented in the blue zone (official UNFCCC negotiation zone) on the Francophonie pavilion (IFDD / OIF – Institute of La Francophonie for Sustainable Development subsidiary body of the International Organization of La Francophonie), in the green zone (civil society and official pavilions zone) in the youth area of the Swiss Cooperation Pavilion, in the Club de France Pavilion and in the ENERGIES 2050 Pavilions in both zones. 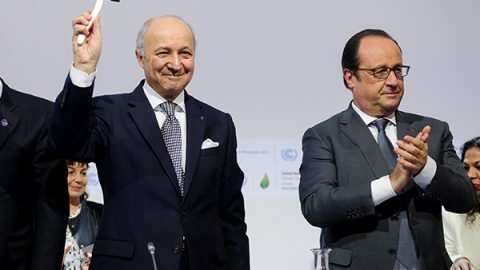 Our climate today, our climate in 20 years, and us? Thanks to the enthusiasm the exhibitions have aroused among our partners and the general public, ENERGIES 2050 association has decided to set this initiative on a sustainable path while expanding the number of co-organizers in order to achieve a more strong mobilization in the long term, visible, structured and conducive to change. It was decided that, every year, a theme would be retained and that all citizens would be invited to express themselves freely on it. 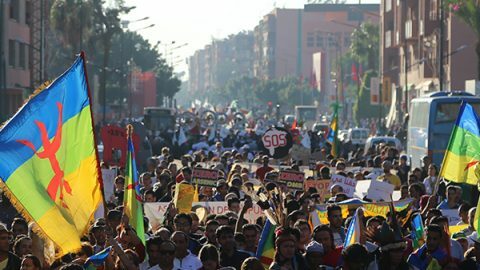 The 2017 edition was organized in partnership with several international and regional organizations, such as UCLG Africa (United Cities and Local Governments of Africa), IFDD / OIF (Francophonie Institute for Sustainable Development / International Organization of La Francophonie), ESMAC (School of Applied Arts and Culture), the Mural Art School of Versailles, Yael Arts World and Afrique Environnement Plus. The exhibition took place during the COP23 in Bonn (Germany) from 6 to 17 November 2017 on the association ENERGIES 2050 and UCLG Africa pavilion as well as in the Pavilion of IFDD / OIF. 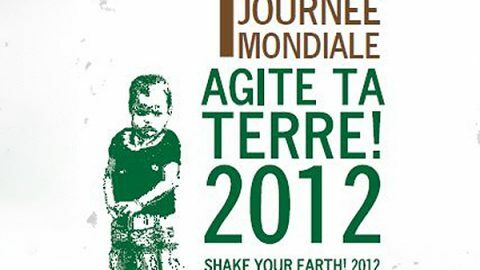 Shake Your Earth was initially the name of a local event organized by the GAIA association, which brings together the students of the Master Pro Environment and Sustainable Development Management at the University of Nice-Sophia-Antipolis . 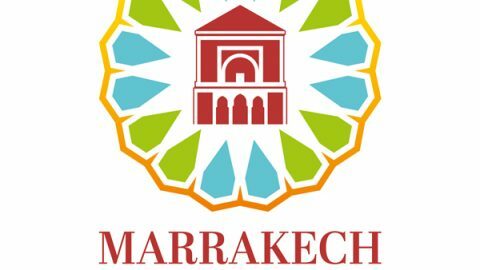 ENERGIES 2050 presented in several spaces at COP 22 an exhibition highlighting creations received in the framework of the international artistic competition launched in 2015 under cover of the 4th edition of the international initiative "Shake Your Earth!". 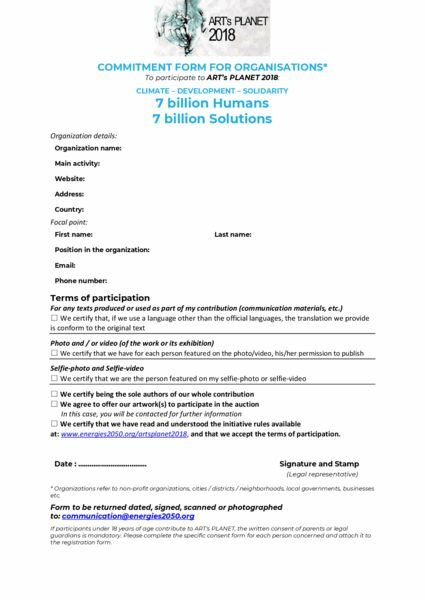 For the 2017's edition of ART's PLANET, ENERGIES 2050 and its partner launch an international citizen and artistic initiative on the theme: Climate, Migration and Solidarity: The Art of Collectiveness. The objective of this international citizen and artistic initiative is to offer citizens, and especially young people and the art community, the opportunity to express themselves and participate in their own way to the major challenges our societies are facing.